I attach a pdf that explains the Polyboard XY conventions. 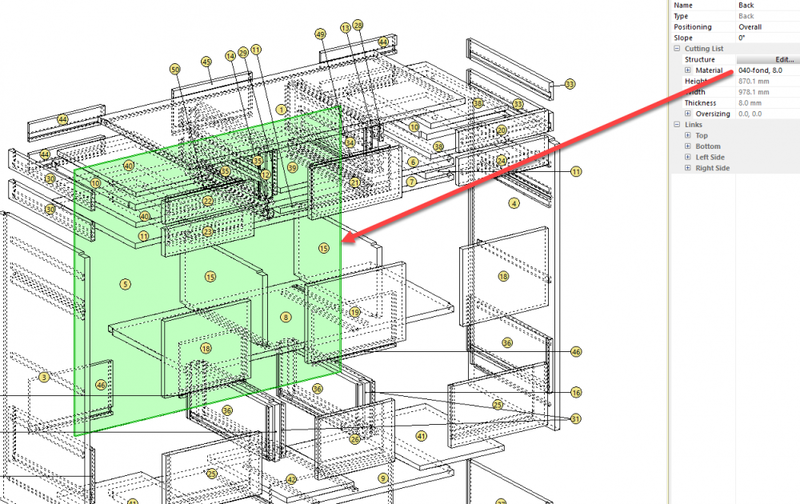 In general you have to import the 3D dxf file into SketchUp. This is only possible if you have the pro version of SketchUp. If you have only the free version, I have made the conversion for you and attached the SketchUp file. Material looks good. On my way to order lumber. Tried to load into sketchup with no luck. Which file should load and any instruction would be appreciated. 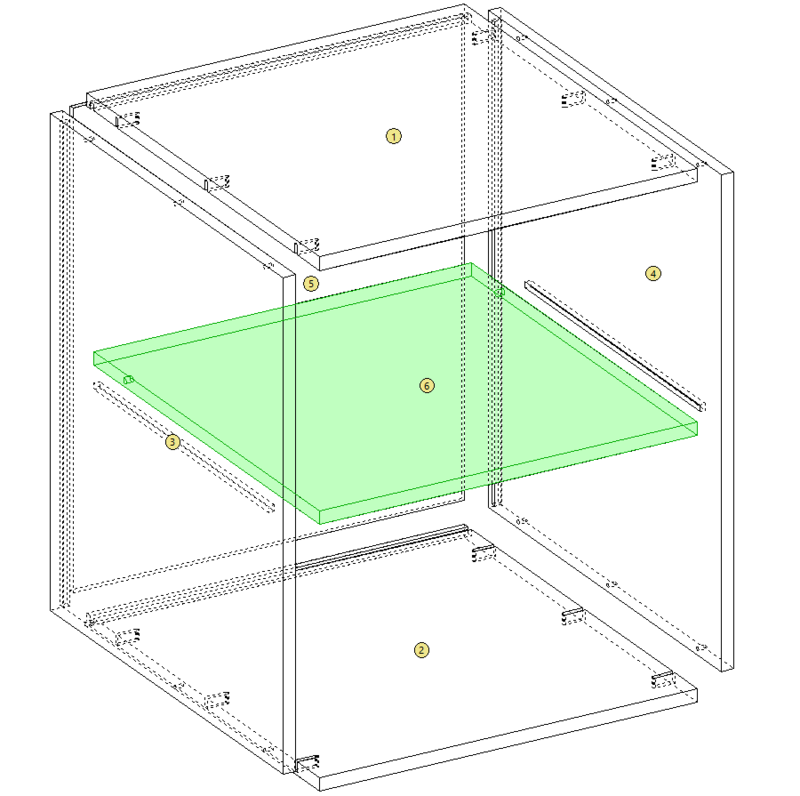 – a dxf folder that contains 2D files that can used in CAD programs (or to run a CNC) as well as a 3D DXF model that you can load into 3D presentation software. to open these files right click the zipped file and do extract (decompress) them to your hard disk. You will then be able to open the Polyboard model in Polyboard and print the pdf documents with a pdf reader like Adobe. 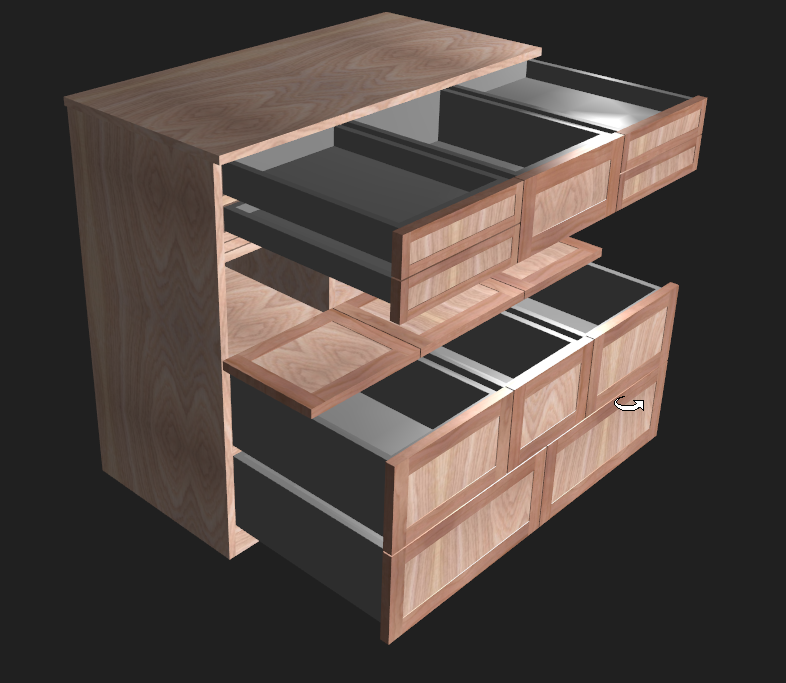 the DXf files can be opened with a CAD program like AutoCad , Draftsight or SketchUp. I hope you enjoy building this project. I’d very interested to see how you build this so don’t hesitate to post any photos you have. Also don’t hesitate to post any questions if you need advise on the build. DO I OPPEN THIS IN POLYBOARD? WHERE? 1- The type of panels are you are going to use will depend on your local suppliers and sometimes real thicknesses can vary or the local supplier may not have 19mm but 18mm panels. I BUY FROM THE MILL AND GET THE SIZE I WILL NEED. I ALSO HAVE PLANING CAPABILITY. For this reason I always suggest that you buy or at least make sure of the exact panel thicknesses before we process a project. 2- When made with panel materials it’s usual to glue veneers on the visible edges of the panels. This hides the rather nasty end grain of plywood or MDF etc. The thickness of the edging material is then deducted from the total width of the panel in the cutting lists. NO EDGING. I LIKE IT NATURAL. Standard edging thicknesses can vary from 0.8mm to 2 or 3mm. Or you may want to glue solid wood edging in this case we’ll need to know the exact thickness you’re going to use. If you don’t know what to do I’d suggest you go to your local supplier and ask his advice on what material will be readily available. We’ll then do the final set up of the project with the correct thicknesses and edging. On the other hand if you are sure you don’t want edging and the panels thicknesses are exact I’ll process the production documents. 1- The type of panels are you are going to use will depend on your local suppliers and sometimes real thicknesses can vary or the local supplier may not have 19mm but 18mm panels. 2- When made with panel materials it’s usual to glue veneers on the visible edges of the panels. This hides the rather nasty end grain of plywood or MDF etc. The thickness of the edging material is then deducted from the total width of the panel in the cutting lists. What handles are you going to use? If the thicknesses are all OK I can send you the working documents. However, note that this project is set up using panel material with no edging. You might want to add edging to have the correct panel cutting lists. Please take time to check all the details of the attached Polyboard model before I process your project. The cabinet file service allows only one production document output per project so future processing will require purchasing another CabinetFile. I WILL NOT BE USING EDGING, JUST FINE SANDING. LET’S PROCESS THE DESIGN. YOU’RE THE BEST. 3/4″: top, sides, uprights, shelves, doors, plinth, uprights, and divides. 5/8″: drawer sides, bottoms, back, and fronts. These look good to me, what am I missing? I like the look of version jack01v02-1-3D with the handles I intend to use. Can we take that one to press? Second option, you want a more traditional look with framed doors and drawer fronts : build carcass with veneered panels and facades with thinner veneered panels and solid framing. In both cases we need to know the final thickness of all the different parts. In this version I’ve set the materials to “generic 0190” type 3/4 (19mm) and “generic 0160” 3/8 (16mm). 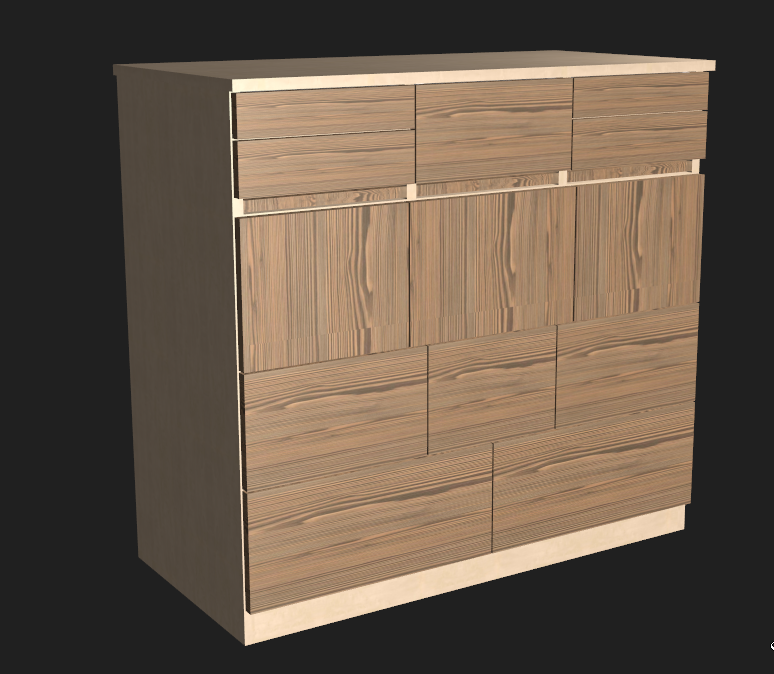 I’ve also adjusted the top side drawers so that they are the same facade height. 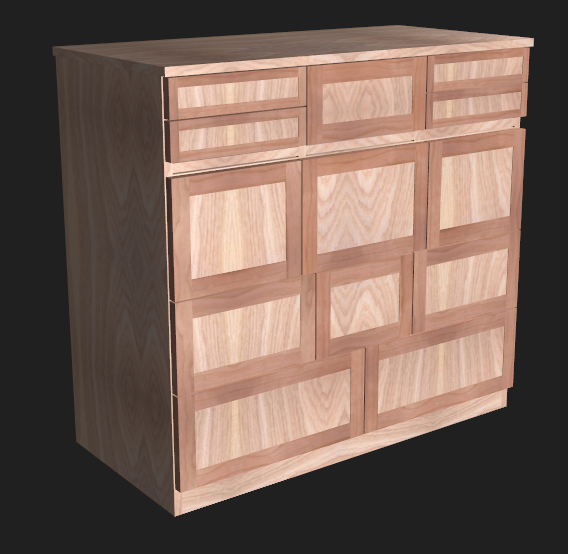 If you are making this in solid wood you’ll should use a frame and panel structure to set this up click a panel and then go to the properties Structure>edit>assembly. YOU LOST ME. DO YOU WANT ME TO CHANGE THE CABINET STRUCTURE? WATCHED THE VIDEO BUT HAD TROUBLE FOLLOWING. AM I TO MAKE THESE CHANGES AND APPLY TO ENTIRE STRUCTURE.? However, you might consider using framed construction for the doors and drawer facades but sheet material for the carcass. This would make the build easier and much faster. I AM OK DOING THIS, BUT IS THIS FOR THE CABINET WE HAVE BEEN WORKING ON, OR DOES IT RELATE TO THE BOOKSHELF QUESTION I HAD? It all depends on the style you looking for. Do you have any photos that would show us what you are aiming at? My library extension is -en. Don’t know why I am getting the French? For the materials, when you say red oak do you mean you are using solid timber, laminated board or veneered boards? In the actual design there is also different wood for the facades and carcass, do you want to keep this? FACADES WILL ALSO BE OAK,SOLID TIMBER. 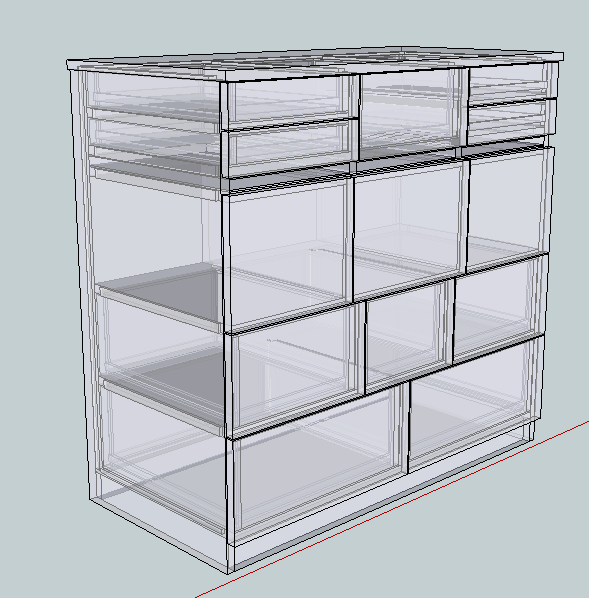 I COULD NOT FIGURE OUT HOW TO PUT A FACADE ON A BOOKCASE I AM WORKIMG ON. WHERE DO I NEED TO LOOK? 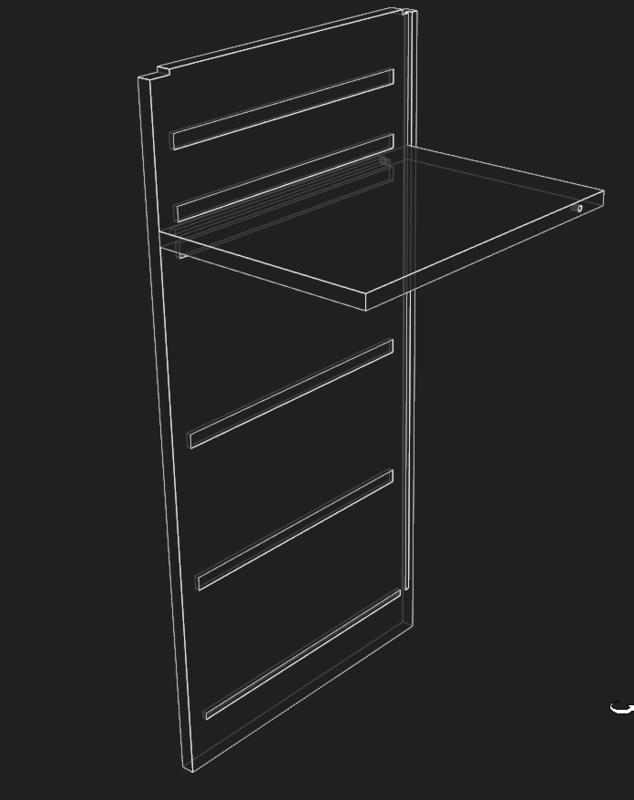 As well as this as you are using the standard Quick Design (french named) materials the backs are in 8mm(15/16″) and the drawers bottoms are set to 16mm(5/8″). I would suggest that you harmonise the materials either by only using 3/4″ and 5/8″ boards by setting the back to 5/8″or set the drawer bottoms to 8mm as well which will make the drawers lighter and cheaper to build. LET’S GO WITH 5/8″ ON BOTH. Otherwise great project and I’m looking forwards to seeing it built. The finished thickness’s can be different as well as if you are using veneered boards we’ll have to set up edging. In the actual design there is also different wood for the facades and carcass, do you want to keep this? I would suggest that you harmonise the materials either by only using 3/4″ and 5/8″ boards by setting the back to 5/8″or set the drawer bottoms to 8mm as well which will make the drawers lighter and cheaper to build. 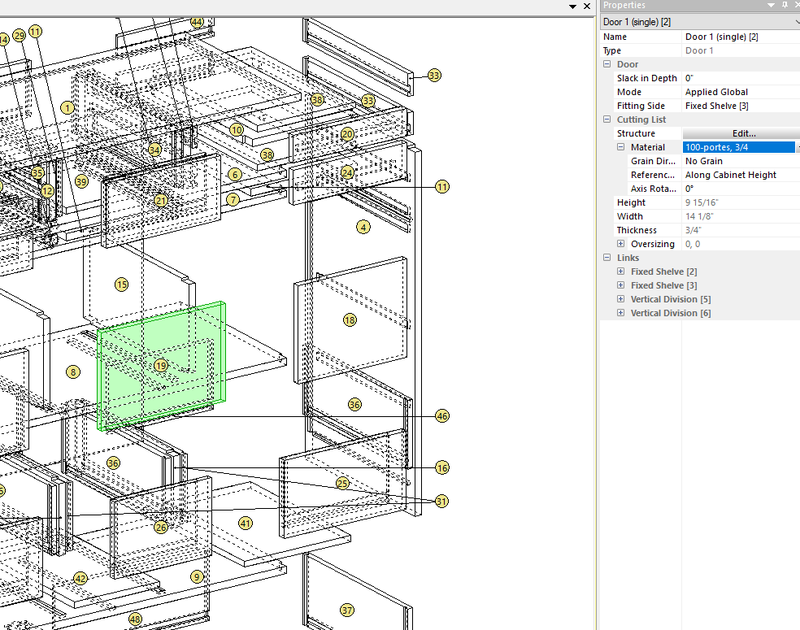 It’s possible that you can’t load my model because your Polyboard is not up to date. I UPDATED THE SOFTWARE AND THAT DID THE TRICK. To correct this, just go to the download page and reinstall. For you design the easiest way to add a base would be to create a plinth and extend the sides. I wanted to suggest you add a base like this but forgot to mention it in my last post. I’ve made the following adjustments to your design: LOVE IT. – made all joints blind dodos which make for a much cleaner design. This design should work fine and you can tweak the file I’m sending. The only problem is the sliding shelf pulls. To keep the clean design, I would put a “push to open” latch to the back of the shelf so that a push on the front will release the spring and push the shelf out. Pushing the shelf back in will click the ratchet and the shelf will then stay in place. LOVE THE CLEAN DESIGN. LET’S UDE THE ‘PUSH TO OPEN’. 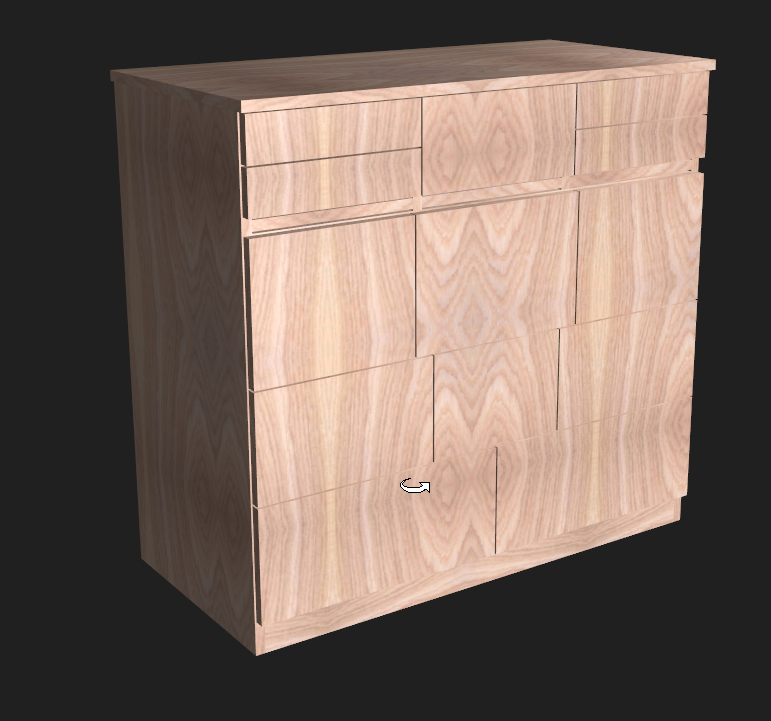 I WILL THEN USE KNOBS AND HANDLES ON THE DOORS AND MAIN DRAWERS. You might also consider using a push to open drawer sliders that would then also replace the dowel stops. To finalise the design we also need to do now is to set up the correct materials. I WILL BE USING RED OAK BUT . I TRIED TO ADD TO THE STRUCTURE BUT COULD NOT GET THE GRAIN DIRECTION. 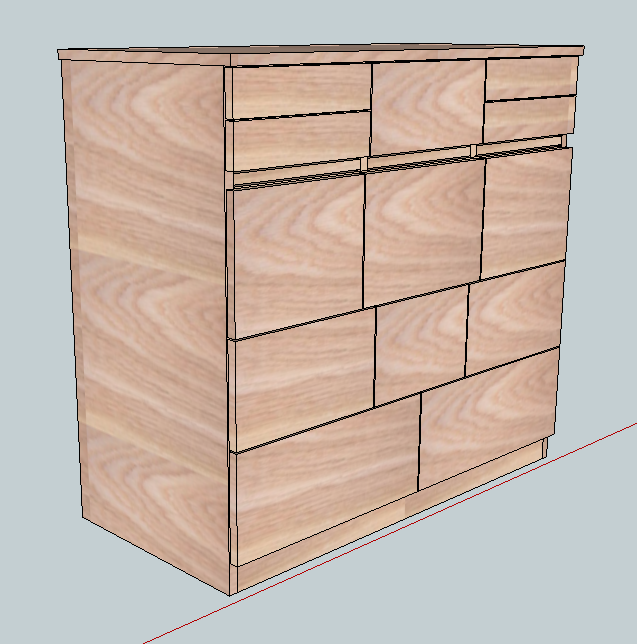 I AM THINKING HORIZONTAL FOR THE DRAWERS AND MAYBE VERTICLE ON THE DOORS FOR STRENGTH? WHERE IS SPECIFIC GRAIN DIRECTION ON THE MENU? You have designed using Quick Design materials and for some reason you are using the French version of the libraries. I DO NOT UNDERSTAND. I DO NOT SEE ANY FRENCH. Can you post the real thicknesses of the different panels you’ll be using? THIS HAS ME BAFFLED. I SEE THE USE OF 3/4″ AND 5/8″. WHAT AM I MISSING? All the best, THANKS. LOOKS LIKE WE ARE THERE AND I AM GETTING TO BUILD SOMETHING.